Urban Simplicity: What is a Cargo Bike? Before I comment on the question posed in this post's title, let me just say that I love this picture, or at least the bike in it. This is a bike that can get the job done...and cheaply. Here I am (and I'm not the only one...you know who you are) bragging about their fancy cargo bikes (mine, of course, is a Yuba) and how much they can haul and all the fancy name brand components...and then I see this the other day locked to a tree in NYC . It's an old Schwinn mountain bike that likely cost a hundred bucks or less and has two over-sized baskets bolted to it. 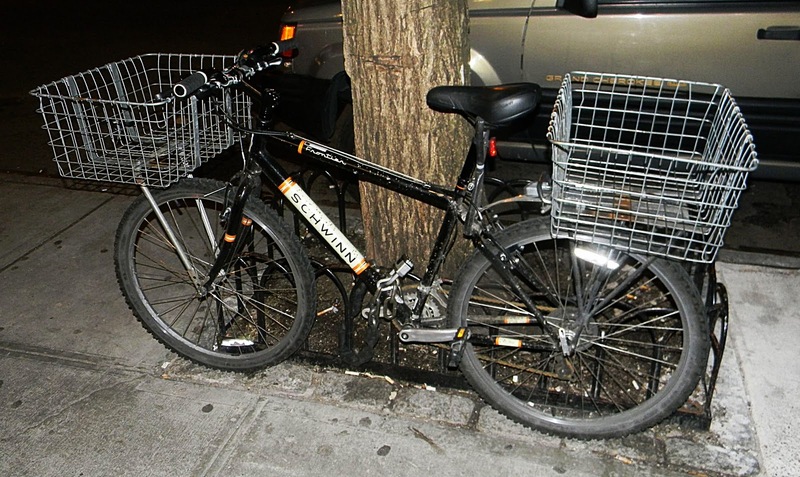 It's also likely that this is one of the numerous delivery bikes seen around the city...in other words, a work bike. Those baskets are awesome, in the literal sense of the word...how easy would it be to carry a week's worth of groceries in them, and no strapping things down. So I ask again...What is a Cargo Bike? In this bloggers opinion, any bike that carries stuff...it doesn't matter how expensive--or not--the bike happens to be. If it gets you were you are going and carries everything you need it most definitely fits the category. All my bikes are work bikes but they were not sold for that I'm sure. #1 is 1975 Schwinn with baskets. My philosophy is if it can't carry your stuff it's a toy like a sports car. "If it can't carry your stuff it's a toy like a sports car." Sometimes it's the simplest--and least expensive things--that make the most sense. jachmilli...thanks for visiting and commenting. I actually do have a u-lock and a chain lock. Depending on the bike or situation I use one or both.